Custom Pools! – Quality, Class, Style – It’s That Simple. Just add water and life gets better! The benefits and creation of your own backyard oasis are endless. Just add water and life gets better! The benefits and creation of your own backyard oasis are endless. Escape the worries of the rest of the world by relaxing by your custom pool or spa after a hard days work, a private place to keep in shape, an exciting destination to entertain for family and friends and creating the perfect extension of your lifestyle. We believe that a custom pool and spa is a must have! 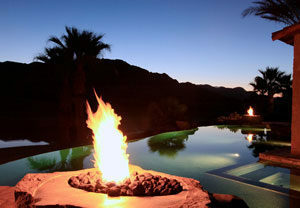 We create Palm Springs Swimming Pools and Spas with superior custom design, innovative aesthetic style, quality materials and professional workmanship. We’re as proud of our work as you will be of your pool. We serve Palm Desert, Indian Wells, Coachella, Indio, Cathedral City, Thousand Palms, Desert Hot Springs, Palm Springs, Rancho Mirage, La Quinta, all the desert communities from our centrally located facility. Give us a try once, and we’ll have a client for life! 760-322-POOL. We use top quality materials that will let you enjoy your pool for years to come. Good swimming pool design is about creating a balance between aesthetics and function. It is essential that the pool look fantastic so that even when it isn’t being used for swimming it is still an asset to the property. 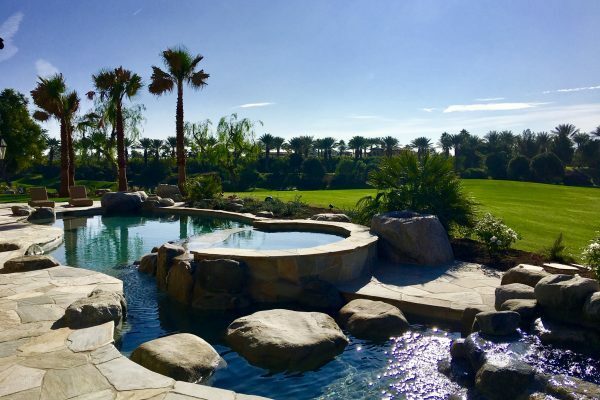 Azure Pools & Spas is the clear choice for Coachella Valley clients that are seeking a company capable of bringing their dreams to life and carrying that relationship into the future through exemplary construction, service, and support. Azure Pools and spas has built hundreds of swimming pools and spas, with projects ranging in scale from small wading pools and courtyard spas to custom masterpieces. We specialize in custom pool designs and construction in demanding locations. Our construction methods and techniques are continually being developed in response to industry advances. Is it time to give your pool a facelift? We have trained professionals who’ve been in the business for years, and specialize in pool remodeling. Let us show you just how easy it is to give your pool the “updated” look you want. and the Inland Empire. For the last 25 years I represent plaintiffs in construction defect cases. Your team has been so professional and responsive. Rick was even watering my plants when the HOA dropped the ball. The pool and hardscape exceeded our expectations. What a beautiful job! Thank you again for your personal approach to what you do. You may share my comments. Caroline and I wish you continued success. My husband and I purchased a new home in Palm Desert in late 2012. With new construction came no yard. We networked to get names of trusted pool installation companies in the area and had each of them provide designs and bids. We chose to go with Azure Pool and Spas. Renee Frye from Azure worked very closely with us through all stages of the process. The contract was very thorough, questions were answered in a timely manner and options were provided. We found them to be very open and flexible with changes we requested and they were responsive to any issues we brought up. Renee was instrumental in resolving an issue to our satisfaction with a subcontractor very quickly. As we don't reside in PD, Renee would send us status e-mails and pictures quite often so that we could follow along. The pool has now been in use for 7 months. Being first time pool owners, we had lots of questions in the beginning. Renee would make sure we understood what we were doing and would come out to show us things that were a bit more complex. We would certainly recommend Azure Pool and Spas to individuals looking to install a pool. It was a positive experience! Contrary to the experience of the previous reviewer, we have had nothing but outstanding service from Azure Pools. Not only did Azure build our 75 ft. pool and spa, but they also provide the bi-weekly maintenance of our pool, spa and fountains (which they also installed). The extensive pool/spa construction was top-notch and completed on time, and the maintenance is always thorough and reliable. When we had a serious problem with our pool (five years after construction), Azure took full responsibility for overseeing the repair - even though they were not responsible for the problem. I highly recommend this company and I know there are many extremely satisfied customers of Azure pool in the Palm Springs area! Dear Renee and Azure Pools, We want to thank you and Rick for the great job of designing and installing our pool. Being first time pool owners we were unsure of what to expect, but you made the whole process easy for us and you were always available to answer any questions we had .You took our ideas and created the pool of our dreams. Even a year after the pool was completed, you still treat us as if we are the most important client you have. We interviewed other pool contractors prior to choosing Azure, but what made the difference was when my wife and I talked to our neighbors who had you built their pools with Azure they all recommended your company so highly. This is truly customer satisfaction. Thank you once again, it was truly a pleasure working with you and we love our pool! We moved into a new house in Indio almost 3 years ago and wanted a pool installed. We had never lived in a house with a pool so I was a little apprehensive about the process. After our first meeting with Renee we were very pleased with her presentation so we decided to contract with Azure. Renee was always stopping by during the installation process to keep us appraised of the construction. All was completed as scheduled and to our satisfaction. The City of Indio inspector who signed off on the project even mentioned that it was extremely rare to have an issue with Azure. We have been enjoying our pool and have also been pleased with the pool servicing provided by Azure. My partner Tracy and I are realtors here in Rancho Mirage. When we decided to buy a home without a pool so we could build our own we met with 2 companies to get a bid and ideas. We had met Rick Neff - the owner of Azure Pools - previously when a client had Azure Pools resurface the interior of a pool she had bought. When we met him he was so helpful and knowledgable that we knew we would be meeting with him for a bid. Rick and Azure was AMAZING to work with. His ideas and vision completely enhanced our backyard and we are so happy with the finished yard. Azure built a stunning 40' infinity pool with an elevated zero edge infinity spa along with 2 columns topped with fire bowls for us. Along the way Rick was open to suggestions and worked with us to get everything absolutely perfect and the way we wanted it to be done. He was fair and professional. I will always recommend Azure pools and spas to any of my friends, family, and clients! In addition, Rick suggested our landscape design and installation company who was equally as professional and talented and as a whole we couldn't be happier with the service and love our new yard! After buying a home in Del Webb's Sun City at Shadow Hills, Indio, I contacted and met with Renee having had a good reference from a former client of Azure Pools. From the outset to the completion, Renee was fantastic to work with. Never a time did I feel sales pressure from here, only a strong interest to fulfill our dreams for a first time pool owner. I never had a chance to meet with the owner Rick, but not a problem, as Renee was wonderful answering all my questions, responding back to me quickly, and especially going out of her way of not being hurried for the many questions this first time pool buyer had for her. The construction process was efficient in meeting out time lines and the quality of workmanship was extraordinary. We made change orders as we went along and the process of that was easy and very satisfactory to all. All of the subs were helpful in answering my questions and happy to talk to me. We are extrememly happy with the end product and have had numerous compliments from all who have seen the pool. Would I wholeheartedly recommend Azure Pools to someone, YES! I remolded my home in Indian Wells CA in 2010. I contacted 5 pool companies and had complete bids from each of those companies complete with drawings, plans and equipment. Not only was Azure Pools knowledgeable they were professional and easy to deal with. They also explained different options that were available. I had done my own research on the equipment and was pleasantly surprised that they recommended that specific equipment and were extremely familiar with it. My complete remodel of my pool, Jacuzzi, drains, decking, and shape were completed ahead of schedule which was important but more importantly it was done correctly. All pool equipment comes with a warranty. I had an issue with my heater a year after completion and when I called they were extremely expeditious in getting the warranty company out there to replace the faulty part. They even called and scheduled it for me and explained their thoughts on the problem. Not only have they gone above and beyond, they continue to do so. I would strongly recommend Azure Pools and Spas as they know what they are doing and there are several pools and spas that you can physically go and look at and not depend on the pictures on another companies website. The owner Rick Neff personally took me to several pools/spas he had built for previous customers.